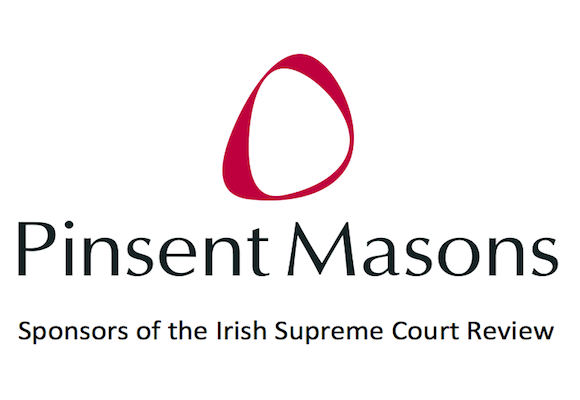 The Irish Supreme Court Review (ISCR), hosted by the School of Law, Trinity College Dublin, and sponsored by Pinsent Masons, is a forum for in-depth analysis of the functions and jurisprudence of the Supreme Court of Ireland. It consists of a conference in late September or early October each year, a journal of the conference proceedings, and a comprehensive website. The papers at the conference and in the journal consider major themes in the work of the Court and its leading cases in the previous legal year, while the content on the website comments on the work of the Supreme Court throughout the year. The first annual ISCR conference will be held on Saturday 6 October 2018 in Trinity College Dublin. All are welcome to attend. Thanks to the generosity of our sponsors, Pinsent Masons, attendance is free; but registration via Eventbrite is essential. We regret that event is booked out; the waiting list is full; and registration is now closed. At the conference, the first panel will reflect on the role of the Supreme Court, especially as it debates matters with other international and apex courts. Three further panels will discuss the top dozen or so leading cases of the Court’s 2017-2018 legal year. The first annual ISCR journal will be published by Clarus Press on behalf of the School of Law, Trinity College Dublin. The conference is presented in association with Trinity College Dublin’s Centre for New Irish Studies, which is part of the Making Ireland research theme hosted by the Trinity Long Room Hub Arts and Humanities Research Institute. The Hub is dedicated to advancing TCD’s rich tradition of research excellence in the Arts and Humanities, on an individual, collaborative and inter-disciplinary basis. Multiple Irelands have been fashioned through the ages; and the Making Ireland research theme explores this profoundly complex inheritance in its local and global manifestations. The conference will be held in the Thomas Davis Lecture Theatre, Room 2043, Arts Building, Trinity College Dublin (map and directions). Unfortunately, visitor parking is not available in College. Both ParkRite and Q-Park have car parks near College and can be recommended to visitors. Thanks to the generosity of our sponsors, Pinsent Masons, attendance is free; but registration via Eventbrite is essential. The ISCR reserves the right to make changes to the programme. Catherine Donnelly, Niall O’Hanlon, Ailbhe O’Neill. Postgraduate interns: Conor Casey, Roisin Costello, James Rooney. Contact us via email or follow us on Twitter at #ISCR18 and @_ISCR.